All the Christmas wreaths from Christmas Farms are lovely choices, but if you want the brightest and boldest look, then wreaths with holly included are the ones for you. The bright red of holly on our wreaths stands out in winter as a stark contrast to a colorless landscape. This red, when paired with other components of our wreaths, make for a beautiful wreath that will improve even the foulest of moods. To make sure that everyone can find the right Christmas Wreath, Christmas Farms offers wreaths that are either 24 or 30 inches big. No matter what size door you have, you can be sure to find the right size Christmas wreath to fit it. Or, if you know someone who needs either of our sizes to fit their home and doesn’t know where to look, try out gift ordering and send the right sized Christmas wreath their way this holiday season! Not only does holly look wonderful at Christmastime, but it has also played an important role for many years. 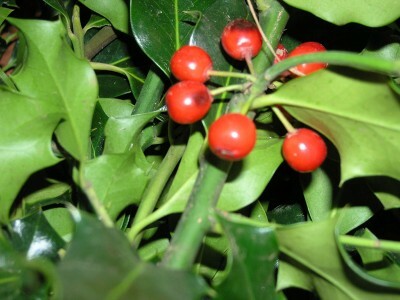 Since medieval times, holly has been a Christian symbol, and is even featured in different carols. It carries a symbolic meaning from many parts of Europe all the way here in the west. When you hang a holly Christmas wreath, you will not only have a wreath that stays bright and beautiful in winter, but one that may also have sentimental value for those viewing it. Bringing the best Christmas trees and Christmas wreaths around, Christmas Farms has served southwest Michigan for over 15 years. With a commitment to providing high quality, fresh Christmas trees and wreaths, there is no better place to spruce up your winter than Christmas Farms.